The Winner of Re:Imagine the Junction design inaugural student competition, is Carlos Reyes, an Urban Design post graduate student from the University of Melbourne. Re:imagine the Junction design competition aims to re-monumentalise St Kilda Junction, and restore St Kilda Rd South (the former High St) and the Princes Highway as the living backbone of the suburb. The study area is bound by Union St to the north, Chapel St to the east, Carlisle St to the south and Princes St to the east. 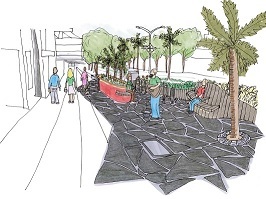 Junction Area Action Group welcomes the ‘Re-Imagine the Junction’ competition for urban designs to re-monumentalise St. Kilda Junction and restore St. Kilda Road South(the former High Street)as the ‘living backbone’ of the suburb. JAAG congratulates the winner Carlos Reyes on his achievement, and commends David Lock Associates and Arup for their initiative in establishing the competition.